With these materials you can build your first starship. The first thing you need to place down is your Ship Core. You do this by tapping X. You now have the option to name your ship. You may not use spaces but underscores are accepted. Once you finish placing your ship core, you may look at it and tap R to board your ship core. Next tap Space to go into build mode. You may now highlight objects in your inventory and place them onto your ship. A good way to begin is to first place some power generators and then thrusters directly behind them. The more engines you have, the faster you will drain energy. Then you should place a weapons computer. The weapons you place from here will be automatically linked to it. Place your weapons, jump in the core again by pressing Space to enter Flight Mode, and you're off! F1 Opens in-game help menu, changes depending on location of the player (Inside ship or out in space). F2 Detaches mouse from ship movement. Return Opens up the chat window. Space Switches between build and flightmode when in a ship. X Create and name a new ship (Ships can be renamed after creation, open a faction module on a ship to rename it, it must however belong to your faction). B Opens the shop interface if you are in range of a shop. R Enter or exit a ship core or build block or activate/deactivate certain blocks. I Opens up your inventory (drag and drop items to the left of this screen when near a shop to sell them quickly). t Opens the weapons menu, here you can bind weapons and usable modules to a hotkey (1,2,3....0). N Opens up the navigation menu, a list of all nearby objects and an option to set a waypoint that will highlight next sector to your destination. F Lock on to the object you are currently looking at. 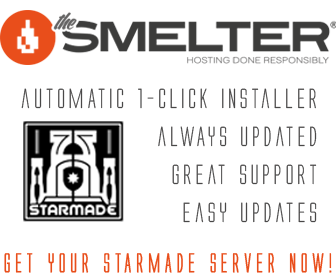 In order to do anything in StarMade you'll want to start collecting some currency to buy modules and materials for the construction of your ships and stations. Find a Space Station and salvage as much Plex Glass as possible. You can then sell it at a nearby shop for 500 Credits each. You may also find a nearby ice planet. You can salvage the Ice Crystals there and also sell them at the shop. In addition, they also serve as a nice building material for your ship, as it gives off a nice blue glow. For a lower income you can also disable AI ships. Once you shoot their Ship Core they will drop a small cloud of loot at that exact spot (mind you don't fly away from this too far if you wish to find it again). These drops can range from thousands of blocks of rare minerals to a few blocks of dirt, if you get lucky you can make billions from a single AI kill, if not, well you might not even earn back what you spend on repairs. Find a desert Planet and collect as many blocks of Cactus you can find. you can then sell it at a shop for 3000 Credits apiece. This is a popular method and is easy as long as your computer can stand a large planet. Note that due to the nature of the blueprint system and the slightly excessive drop rates of AIs, manufacturing is somewhat useless at this point, future updates will eventually balance the game and work out these problems, but until that time manufacturing is more of a curiosity than a useful mechanic.